Plastic water bottle for pet rabbits, drip-free and with special stainless steel valve; attach to the cage and refill from the top. This rabbit water bottle from quality plastic features a horizontal drinking piece from stainless steel. 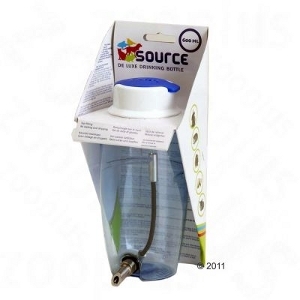 It is equipped with an anti-drip valve that makes drinking easy for your rabbit and keeps the cage dry. The top features a lid for refilling. Add water vitamin drops or medicine conveniently without the need to take the bottle off the cage! The water bottle is attached to the cage with a rubber band (included) and two stainless steel hooks. A deep groove on the bottle prevents sliding and keeps the water bottle securely in place.